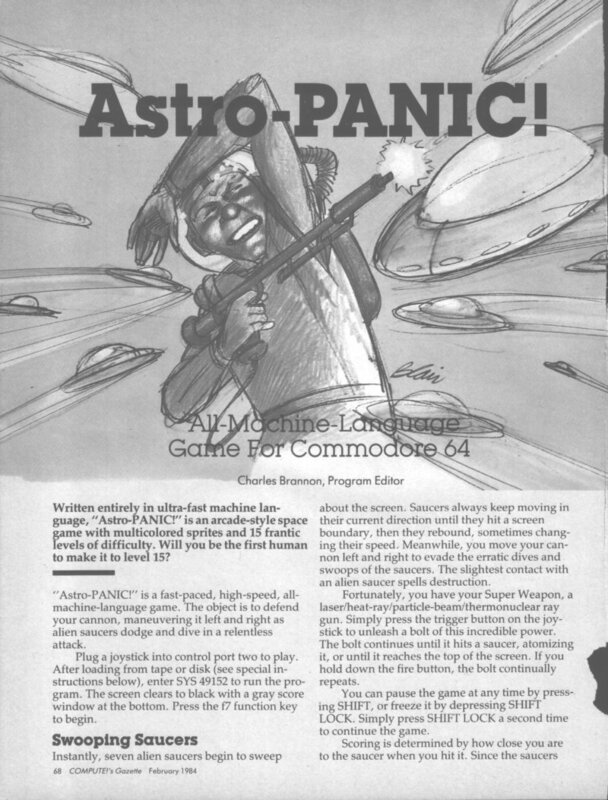 Astro Panic Astro Panic is a classic Commodore 64 game. The game is simplicity itself, and perfect for a lazy afternoon of mindless blasting. The instant pick up and play element is the reason why games like this stand the test of time. Although very repetitive, the gratification that can be achieved from clearing levels of alien invaders can sometimes be second to none. Originally released in 1984, published and developed by Compute Publications. The game Astro Panic was designed by Charles Brannon and is a single player game of the shoot 'em up genre. The object of the game is very straightforward. As the gamer you start the game with three lives and have the job of defeating wave upon wave of enemy spacecraft. After the completion of each wave, another alien craft is added to the next wave of attack. Each wave is of increasing difficulty. The games ends when all three lives have been used. At the current time of writing only one true sequel exists of the game, entitled Astro Panic 94. There is however a homage to the Commodore 64 game called “Panic” that is freely available to play or download from various retro gaming sites on the internet. Panic is also a single player shoot 'em up, in which the gamer battles his/her way through levels of alien invaders. Panic is published and developed by Coin Op and was released for the internet in 2001.